Success isn't magic, it's cause and effect. There are actions people have taken in their life that have had profound impacts that made them successful. Success derives from the mind: Mind > Thinking > Action > Success. Your mind is the boot loader for everything, it's the most important thing to understand and improve if you want to perform better in life. Because of this, I've had a fascination with successful peoples minds. I wanted to study them, how they think, and how their brains function, so that I could assemble one for myself. In today's video I show you what billionaires minds look like, how they work and how to assemble one of them for yourself starting today! 1. Why do two people receive the same information and get different results? 2. Why I've been obsessed with understanding how billionaires think. 3. Why the human mind is more important than the information, but everybody ignores it. 4. The "5 Layers" of the billionaire mind: Mental awareness, Mental cognition, Business principles, Business disciplines and Business processes. 5. Why most entrepreneurs fail because they try to install high level components (tactics) on faulty base level operating systems (their brain). 6. Why most people focus on "single skills" and end up failing in life and business. 7. Why billionaires are "full stack" and understand multiple business disciplines on top of a solid foundation of mental awareness and principles. 8. How to reprogram your brain so that you can become full stack (practical action steps). 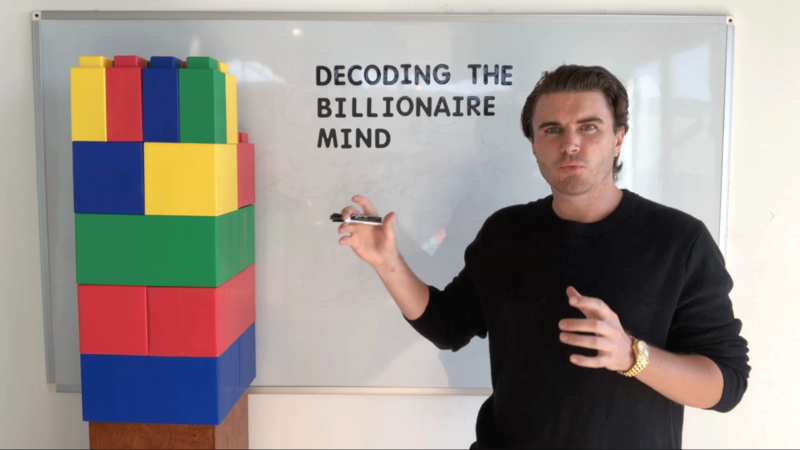 Hey everyone, Sam Ovens here, and in today's video, I want to decode the billionaire's mind. And want I want to do is take you inside the mind of a billionaire, and really show you what it is, how it works, and how it is fundamentally different in pretty much every way, shape, and form from the average person's mind. Now, why this has been a point of interest for me, is because personally I've been trying to learn how to become more successful and how to function at a higher level, because behind success isn't really magic, it's always cause and effect. And there are actions that people have taken in their lives that have had profound impacts that allowed them to become successful. It didn't happen just by chance. It happened by taking specific actions. Now, what causes somebody to take an action is thinking. It's analysis, it's rationalizing, and it's viewing things and making trade offs every single day. And the piece of you that is responsible for that is the mind. And so, if we reverse engineer this thing back, actions create success, thoughts create actions, then the mind creates the thoughts. Then, really, what's lying at the base of success is your mind and your mental function, and how your mind works. And so, that's why it's been a real point of obsession for me to study billionaires, and not just billionaires but really successful people in every different field, from athletes, to musicians, to military leaders, to all sorts of different people from all different eras. And to really pull apart their mind and really decode their mind, and figure out how it worked, and why it enabled them to see things more clear than the average person, and make better decisions and take better actions, which is how they came to get to where they are. So, that's why it's been a real point of focus for me to really study the billionaire's mind and really successful people's minds, so that I could then assemble one of those minds inside my own mind. And so, that's what I've been trying to do for the past six years. I'm not a billionaire yet, but so far I've been able to go from living in my parent's garage and with zero dollars at all, I didn't even have a college degree or anything, to starting consulting.com, my company, and growing it to the point now where it's making around $30 million dollars a year. And all of that happened in about five, six years. So, I'm by no means a billionaire, but I have studied these people's minds a lot, and I've been able to reveres engineer it back to specific things that not only myself, but you can do, starting today, so that you can dramatically improve the decisions that you make, the trade offs that you make, and the actions that you take everyday. And that's going to have an impact on your success in life, and in business, or whatever your field is. Now, the reason why I really wanted to dig into this and study it, is because this thing has always interested me. Why, if you take one person and you put them into contact with some information, and this information could be an online course, it could be a university degree, it could be a book, it could be anything. But let's say you have a person, they come into contact with information, and that results in massive success. Let's say this person becomes a billionaire. But then, say we have another person, and they come into contact with the exact same information. So, the information variable here is identical. So, two different people, but very similar, come into contact with identical information. One output is a billionaire. The other output is a complete failure. So, why is that? Why can two people come into contact with the same information, and get inverted dramatically, like extreme results? Why is that? And why that is, is because it's not about the information. The information plays a role, but it's not the main part. The main part of this is actually the human's mind. That is the main piece here. And what's fascinating is the way we look at education, and online courses, and everything, is we just look purely at the information side. We think, okay let's just get these people to learn this information, and they should get this result, because someone came into contact with this information, the output was this, so therefore we should just force this upon everyone and that output should be the same, or to varying degrees the same. But, what we see in the world and what we see every day is this. We don't have a homogenous output, we have wildly varying outputs. And it's because we've never really looked inside these people's minds and how that works. What I've really tried to do is dig into this. I've studied other people's minds, my own, and I've even been ... my business cosnutling.com, what we do is we help people start their own businesses from scratch. So, we take people who have no experience with business or anything, and we have to teach them everything and help them make that dramatic transformation into starting a business and being successful with it. And that's a huge shift. So, I've observed 20,000 people over five years go through this, and I've observed what happens, and the people how have trouble with it, the people who do okay with it, and the people who get extremely good results with it. And it's fascinated me, and I've really dug into this and looked at it. And what I've found is that there are layers to, like every human's mind, every human's brain. There are layers and what's fascinating is that when we go to learn a specific skill, let's say the specific skill is going to be how to run Facebook ads. So, that specific skill is going to be up here on this processes layer or this process layer. And beneath this we have a business discipline layer. So, this layer here ... so, I'll write this on so you guys can see it. So, here we have processes, and then on this layer here we have business disciplines, and then on the layer beneath it we have business principles, and then on the lay beneath this one, we have ... this one here is mental cognition and then the layer beneath it we have mental awareness. Now you're probably thinking what are these things? Why are we talking about these things? Well, let me explain all of them. If somebody, and I see this happen every single day, somebody will come in and they want to start a businesses or be an entrepeanuer, and they think okay, well what do I need to learn? Aright, the hot topic is like Facebook ads and so I'm going to come right in and just learn all about Facebook ads. And so they go in and they do that, and what they're doing is they're acquiring a specific process skill, like this one little block here. They're acquiring this skill but it's operating on top of all of these layers. The best way to think about this is, you've got like an operating system on your computer, like Windows or Mac operating system, and then on top of that you can install applications, like Microsoft Word, or Keynote, or different things. And then within those you can create different files and create different things like that. Now, if you install a specific software application on a bad operating system. Let's say you try to install a Microsoft Windows application on Mac OS, it's not even going to install. Or let's say you install a real memory hungry application, like some sort of graphics, heavy graphical interface application, on top of an operating system that's outdated with not much RAM, and not much available memory and hard drive space. Well, that application is going to be running very poorly. It's going to be extremely inefficient and it's not even gonna really function. And this is what I see happen in business every single day. Is people are just trying to learn these processes and these specific things, but their foundations of their mind are in seriously poor condition. And basically what they're doing is trying to install, like how to run Facebook ads on top of really no knowledge of businesses disciplines, no knowledge of businesses principles, and poor mental cognition, and poor mental awareness. And when this happens it's just like building a house on top of sand. It doesn't matter if you get a multi-million dollar house with the fanciest design and everything, if you lay that thing on top of sand, it's going to fall over, and it's going to be completely useless. And people don't look at these layers beneath. And they don't work on these layers beneath, and then they wonder why these things up here don't work for them, and they wonder why things are glitching up here. This is why two people can come into contact with the same information and get different results, because it's depends on the layers of the person's mind. Somebody who's more aware with better, sharper cognition, and with better business principles and a wider array of business disciplines, is going to learn information and perceive information in an entirely different way. And let me give you a perfect example of this. Let's say that somebody is much more ware, and has much better problem solving abilities, and much better critical thinking abilities, and lots of different mental models to run things through. And then on the business principles layer, this person has a really solid kind of paradigm and ideology of how they like to run their business, and they've got some values and some principles they like to follow. And then up here, on the business disciplines layer, say this person understands accounting, they understand tax, and they understand sales, and they understand marking, and product development, and they understand management as well, and looking after teams and all of that. Well, now if that person, if they learn how to run Facebook ads, when they're going through that information they're going to see all of these connection all over the place, that the other person can't see, because they don't have this base foundation. So, the person who's got all of that and they're learning Facebook ads, they're going to think, "Oh, this is how Facebook ads would affect the PNL. This is how Facebook ads would affect the balance sheets. Oh, this is how Facebook ads would make that thing work, or this is how sales kind of comes in and interrelates with Facebook ads. And this is how product development comes in and connects with Facebook ads." They're starting to connect all of these different dots between all of these different layers. And then their style, and their method, and their way of running Facebook ads is going to be massively influenced by these lower layers, because ever single layer of your mind, the layer above it inherits everything from the layers below. So, if you have really poor awareness and self-discipline. It you're at this awareness layer, if you're not able to catch things. If your attention span is really short and if you've got really destructive behavior and habits, and if you also have a poor sense of identity and you've got a lot od delusions and false beliefs and things like this, then if this person tries to learn anything it's game over. This person has problems just sitting in front of the computer for an hour and watching a video that's longer than two minutes, let alone starting a damn business. This person here, it doesn't matter what they learn, they're screwed. And the person with bad mental cognition, it doesn't matter what they learn, they're screwed. So, these layers down here are of extreme importance. So, this is how we can get the massively different results. The person who becomes a billionaire from this information, they're able to see all of the different interconnections, and they have really solid foundations, that they're able to just take this information, apply it between all these different things and then execute it as a functioning business, or executing it as a functioning anything, and making a massive difference. Whereas the other person just sees words, because all that is to them is words. A classic example of the other person is when they learn Facebook ads, they're thinking, "Well, how does this work financially? How does this ... If I spend money on ads, how does this come back? Is that going to be a profit or a loss?" They're already breaking down mentally. And then because their awareness and everything is so bad, they're not even going to be able to sit down in front of the screen and write Facebook ads for an extended period of time, because their attention span is so horrible. And then they're going to have no mental cognition skills. They're not going to be able to problem solve things when problems arise. And problems always arise. One thing we can grantee is that problems are coming. They come everyday, all the time. It's non-stop. So, if you're not good at solving problems and thinking critically, then none of this is really going to work. This is what nobody is really treating anyone, anywhere, ever. People are just teaching skills these days. When I look outside and I look at entrepreneurs and these different things they're learning, they're learning specific skills, processes, or tools, and they're installing it on top of nothing. That's just results in nothing. They don't want to look at these layer beneath because they think, "Oh, that's just some like whoa whoa crap. Or something that doesn't really matter. I just want to learn the technical like nuggets. I want to get those gold nuggets." Well, these are where the gold nuggets are, and you can have a lot of these, but if you don't have these base foundations you aint going to make anything happen. Or if you do make something happen, it's going to be short lived. You're going to self-sabotage it and it's going to crumble. And the moment you face a problem, because you don't have this stuff down on the bottom, you're just going to fold. You're just going to completely crumble in the heat of the moment. And that's why billionaires, you know the billionaire mind, is really well built. It has these layers really dialed in. Now, what I'm going to do is just walk through each one of these layers and describe it to you, so that you can understand what it is, and how you can start working on your mind to make it full-stack, like this. And that's the term I've come up with to describe this billionaire mind. It's like a full-stack mind. And it's when you work on every single layer in the stack, and every single different interconnection on the stack, and you master the whole thing instead of just the part, because if you just have a good part installed on a rotten foundation, the part will rot. So, metal awareness, what is that? And I'll write these things down for you. So, mental awareness is really the first layer and what it's all about is basically ... how am I going to fit this in? I'll just be able to fit it in here. What it's all about is your self-awareness, so how aware you are of yourself and your own thoughts, and your own actions, and your behaviors, and your habits, and your tendencies, and the patterns that seem to repeat in your life and your existence. Someone might be like, "Self-awareness, I know myself is here and I'm aware of that, so I'm self-aware." Yeah, this is different. This is being incredibly aware of yourself and your thoughts. Basically you know when you've got a higher level of self-awareness is when you focus on the patterns of your thoughts, instead of the thoughts themselves. So, you're kind of taking a third ... what is it called? It's called a third-person view of yourself. You're really looking from a bird's eye view on yourself and how you're interacting. Instead of being kind of stuck in yourself. Now, I'll just close that. Something just popped up on my phone. So, you've got self-awareness, you've also got your identity. And your identity massively shapes everything in this stack. And what I mean by this, is it's you self image of who you are. So, there's who you are physically and everything, but then there's who you think you are, and how you see ourself, and what your self-image is. And this massively shapes everything, because if you think, "Oh I'm not good at math and I'm not outgoing, and I'm not able to do that, or I don't have much energy or work ethic." Then you're going to carry that into everything you do. And so, as soon as you come across some math anywhere in this stack, or anywhere in your business journey, you're going to be like, "Oh, no that's not me. I'm not a math person." And I see this happen all the time. I see it with people often say math or technology. I see it a lot, especially with the older generation. They see, "Oh, no technology. That's not me. That's not me." And honestly guys, it's 2018. If you think technology is not you, then you are fucked. You need to stop saying that, because it's not true. You can't show me this imprint in your DNA that proves that technology isn't you. You made it up. It's a delusions. You cooked it and you're believing, and you have to be the one that pops it, because it's not true. You can learn technology. If you think you're not good at math, you can learn math. It's also your ability to ... It's your belief systems, so what you believe is true and not true about the world. A lot of people have a lot of these, like making is evil or making money is bad, or all of these different things. You have to fix all of these before you can really have any success anywhere else in this stack. Everything you learn on top of this base here, will get these things inherited into it. It's like having a virus in the operating system of your machine, and then installing applications on top of it. The virus is just going to string it's way right through everything. And so, that's mental awareness. And I'll put out here ... well I'll just rub out that one here, so I've got some space. Now, let's talk about the second layer. And there's more things to mental awareness than just this. There's a lot more to it, but for the sake of keeping things brief, I'm just going to mention a few things from each stack. The second one is mental cognition. What this is, is this is your ability to problem solve, think critically, and prioritize different things. It's basally the layer in your mind the receives all of these different requests. There's all this different information flying into your mind all the time, like maybe I should do that, maybe I should do this thing, or do that. And this layer here is responsible for scheduling things. It's like, okay, how important it this? And it weighs it. It weighs it's upside and it weighs its potential downside, and it weighs its affect horizon and it also looks at all of the other pieces in the system, and then it assigns kind of like a priority, when this thing should be executed. Is it critically important for survival? If so, then it should run now. Execute now. Take the front of the que, go. Or, if it's not so crucial, it should just a back position in the que and get scheduled later on, because it's not that important. But also, if something's not important at all, this layer here will just discard of it, and just ignore it. So, this piece is huge and I see a lot of entrepreneurs who have some good self-awareness, and they've got some good top level skills, and principles, and disciplines, but their cognition layer is seriously missing. It's like lacking. And prioritization is a key one, because I see people all the time, they delay working on the thing that's most important, and they prioritize, and obsess about, and spend a hug amount of time on, the thing that is useless. So, when I see this kind of behavior happening again, and again, and again, it tells me that this person has a really backwards cognition layer in their mind. And they're not able to weigh things correctly and prioritize things correctly. This layer of the mind is also responsible for planning, thinking out into the future, breaking things down into chunks, scheduling them, delegating them to other people, and planning, and contingencies. Like what happens if this happens, then we should do that. Or if that happens then we should do this. It's like a really powerful layer of the mind. And it's also good at problem solving. Problems come up all the time, and this layer of the mind will help you solve it. How do you trouble shoot a problem? What are the different mental models that you view the problem through? What are the different perspectives that you flip between, and what are the different problem soling methodologies, and frameworks, and things that you deploy when you come into contact with a problem? This is mental cognition. We've also got pattern recognition. So, how easily you're able to spot patterns in your own behavior, in your life, in your business, in the data that you see for ads, in your accounts, in the way your industry is evolving. Pattern recognition is very, very important. When you study billionaires you'll notice that they're hyper aware. They're extremely aware. They catch things, they catch details, and they can see things that other people can't even see about themselves. It's almost like they have x-ray vision, they've got like a clairvoyance. This hyper awareness, you're not born with it, it's made, you can teach it to yourself, it just takes practice. And then the cognition layer, billionaires are amazing at this. Their problem solving abilities, they can just go [inaudible 00:25:23], bam, find it, done, before anyone else has even processed the information. They're also able to prioritize things properly. They're able to put things back in que, say no to things, ignore lots of things, and focus on the key important things. That's why this layer is of exceptional importance. In your business principles, so where am I going to write this one? I think we'll put it ... we'll just put it here, if you can still see it here. Business principles. What are these? So, these are your values and your beliefs about how to run a business. And these things are crucial. At these base layers, we're not even getting into business. Down here, we're not even learning business skills, we're learning mental awareness and problem solving, and mental models, and cognition, and all of this. And then we're only getting into business on this layer upwards. And business principles are different beliefs you have about business. So, I'll give you some of mine for example. I run an online education company and so I need a central point of focus, one thing that I always default on. And that is like student obsession, like the student is the most important person in the equation. So, whenever I have to make a trade off or anything, I think, what does the student want? If the student was here, and they were listening to this, what would they choose? What's best for them? Not what's best of me, not what best for different people in the company, not what's best for profitability or margin, what's best for the student through their eyes? So, that's like a principle, student obsession. Another one would be, that we focus on cash flow. So, we're not too concerned about profit margins or profits, or quarterly profits, or anything to do with profits or earnings. What I'm most interested in is cash flows, and specifically long-term, future cash flows. That is what I'm focused on. This is very different. A lot of business people they've just go their eyes fixated on profits, and all they want is profits. But in my belief system, I think profits, people who do that are kind of silly, because they're leaving themselves open for somebody to come in and take their market away from them, by just simply not making as much profit. That's leaving yourself open to a very easy place to attack. And also, you've to pay a lot of taxes and it's highly inefficient. And you're also not investing a lot back into the business, and to research and development and to things like this. So, this is just one principal. So, I've got student obsession, I'm cash flow focus, or long-term, future cash flow focused. And also, I think about the long-term. So, if something's going to make my company less money this year, but more money in three years, five years, 10 years from now, I'll take the long-term one any time. That's another one. And also thinking from first principles. I like to have in my company, like an idiosyncratic kind of method of thinking. I like to think differently and not just follow the crowd. Instead of just doing what everyone else is doing, what we'll do it we'll look at it, and break it down to it's first principles. We'll break out this thing into it's different constituents parts, we'll analyze all of them, weigh all of them, and then find the best way to reassemble these constituents parts to achieve an optimal outcome. Instead of just doing what everyone else is doing. And what this leads to is quite abnormal behavior to be honest. A lot of things that a lot of people are really obsessed about, I completely ignore and people think I'm an idiot for doing it. And then a lot of things that people never touch, I obsess about, and they think that I'm stupid for doing that. This is idiosyncratic thinking, and it's the by-product of having a first principles kind of world view, and a scientist world view, instead of just a fashion point of view. Fashion follows trends, but a scientist looks at the constituent parts and the first principles of everything. So, those are a few different business principles. Then up here, we have business disciplines. So, what are the? So, I'll write here, cash flow focused, and then student obsessed, and then we also had first principles. Alright, and I'm pretty sure you can see that. But now, what about business disciplines, what are these things? Well, how am I going to fit these ones on? I should be able to fit it, if I write here, what happens if I go like that? Good, this will work. So, then we're up to number four. Business disciplines, here's where this layer starts to have different paths. So, you can see these layers, this is all blue, this is all red, this is all green, but up here we have different pieces. So, these are kind of the foundational layers, but as soon as we get to the business discipline layer, we can have different disciplines. So, if we know accounting that could be one, and then if we know finance or law, or tax, that could be another. And then marketing could be a different one, and then sales could be a different one, product development could be a different one, and then management could be another one. And what happens is our education systems, like our universities and everything, what they do, is they don't teach anyone this, they don't teach anyone this or this, and what they do is they teach people only one of these. So, you just learn marketing, or you just learn finance, or you just learn this one things. And what this leads to is just single skilled workers. And this is a really fascinating argument, it's like should you learn one thing and just focus on it, or should you be a generalist and learn a broader range of things? And what you'll notice is if you study billionaires, or really successful people, they are pretty much in every single case, like full-stack. And what I mean by that is not just through here, but multi-discipline, so they know lots of different things. And this has been the case for me too, along my journey, I've thought, "Alright, I'll just learn this marketing piece." And then I learn how to do that, and then, "Oh, now I need to sell." Now the result of running this marketing thing generates appointments, and now I've go to get on these appointments and sell. But now I don't know how to sell. So, what do I do? I've got to learn sales now. So, then you learn the sales part and then you're like, well, what am I selling? Well, now you've got to come up with a product or a service. How do you do that? That's like product development, that's like learning how to research and learning how to find problems that the market has, and craft solutions to them. This is a whole nother thing. And then once you've done all of these, so now you've learned marketing, sales, and product development, and research and things, now you're running but now you need to learn accounting, so that you can mange everything and know how it all works economically, and how all of this outputs on the balance sheet and the PNL. And then you do that, and then comes tax season, and now you've got this tax stuff. And so, it just keeps going like this. And the belief that a lot of people have, is that you can just hire other people to do that or just get contractors to do all of that, but what you'll end up finding is they're just not good enough, because they're single skilled workers. All they know is their little thing, and so when they look at your part of your business, all they can see is that, and they can't see how it interconnects with all the other parts, so they give you stupid advice. This means that you can't really trust these people or fall back on these people. What I've found through my experience in business, is that I've pretty much had to learn how to do everything myself. So, I've learned accounting, tax, law, corporate structures across different countries and internationally. I've learned cash and accrual based accounting. I've had to learn marketing and then I've had to learn sales. I've had to learn product development. I've also had to learn statistics and analytics, and things like that, and probabilities, conversion rate optimization. I've had to learn all of this as well as management functions like how to hire people, how to make sure the culture and everything is good within the company. How to create incentives and compensation plans. All of this stuff. I've had to learn all of it. That's happened by accident, kind of just because I've had to along the way, but what that resulted in after a while was really good knowledge across all sorts of things, and an ability to go in at every different part of the business and see how that interconnects to everything else, and trouble shoot things real quick, and problem solve things real quick. When you learn the full-stack, so multi-disciplines and the stuff down here, what you'll be able to do, is do the work of 30 people yourself, and move 100 times faster than the 30 people would as a team. Now, you want to have that skill and billionaires have that skill. Billionaires are multi-disciplined. They are typically like T-shaped, and what I mean by that is they have a broad knowledge of all these different things, but they focus in an extreme obsessive way on a particular thing. So, someone might know law, taxes, accounting, and all of this, but they might focus incessantly on just corporate structures. But they have to understand all this other stuff in order to do this. And what I see today, as a lot of entrepreneurs just learning one discipline, and then they go out into the world, and they're not able to do anything. They're not able to create value, because businesses are the things that create value for people. Businesses have value. And businesses are made up of lots of different interconnected parts, and so if you want to start a business you need to know the different parts and how they interconnect. You can't just know one piece. That's how you get a job at a corporate, not how you create a business and add value in the world. And so, this is a very important thing. Then on this top layer where we've got like processes, and tools, and things like this. And you have different processes and tools on top of every discipline. So, on top of just the discipline of marketing, I understand Facebook ads, I understand like click funnels for landing pages, I understand analytics, and I understand conversion rate optimization, and I understand a whole bunch of different processes, like how to create ads, different frameworks for ads, just within one channel. And then I know how to to do copywriting and then I know what types of images and things would work well. And I know the psychology of marketing and all of that. And so, these are all different specific processes, tools, and skills that just sit on top of one discipline of marketing. And then with sales, you've got different skills, processes, and tools. And then on top of finance, or product development, you've got different processes, tools, and skills. And so up here we get into the actual, what is the step-by-step process of how we do this thing. Here is the discipline, the marking, the sales. Then we've go the principles, so it's your core beliefs about operating a business. Then your mental cognition, your problem solving abilities and your prioritization, and planning, and forecasting, and mental models, and all of this. And then down here we've got your awareness, and that is self-awareness, identity, belief systems, things like that. Now, like I said earlier in this video, what I see today is people just learning tools, how to use the [inaudible 00:38:46]. Good God, if you just learn how to do that, you're useless, or just processes, how to just run this specific process. What do you do when the processes breaks? What the hell do you do now? You're screwed, because all you know how to do is execute a process. You don't know the discipline on which the process sits, and you certainly don't know the principles upon which this process was founded and created on, and you don't know how to prioritize and problem solve anyway. And you're not even aware at the base level, so even when it stops working you probably won't even notice that it's stopped working, and you'll just continue to execute it, and it not work. And you're not even aware that it's not working. I see this every single day. The purpose of this video is to really show you and decode the billionaire's mind. How it works, what it is, and how it's fundamentally different from the everyday normal person's mind. And if you want to be successful in life, and in this world, and any endeavor, then you honestly need to focus on becoming full-stack. You need to work on your awareness, your cognition. You need to develop principles, your philosophy of things. And then you need to learn different disciplines, like even Michael Jordan, he could play offense and defense. He was one of the first players that could do that, because players usually focused on just offense or just defense. He played both. And so, we see this everywhere across all disciplines. Michael Schumacher was one of the only Formal 1 drivers who was a mechanic and would get in the workshop with his mechanic, for his Formula 1 car, and know what's happening with everything. He had come off the track and say, you need to tune this. I want this fuel mixture upped here. I want this fuel mapping to have more kick down here. And it needs to not be as spiky back here, or that back left tire needs to go up one PSI. He would know the detail. He was full-stack. So, whatever the thing is that you want to achieve and succeed in in life, then I can tell you that the way you're going to be exceptional at it, is through becoming full-stack. So, that's it for this video today. Now, what I want you to do, is if you enjoyed this, just click that like button, and let me know what you thought in the comments section below, just give me some feedback. Also, make sure you subscribe to my YouTube channel. I release a video like this once a week, every week, as well as customer interviews and other resource like that. So, thanks for watching and I look forward to seeing you in the next one soon.